Experience Microsoft’s latest products with these FREE options! Live migration is an important VM mobility feature that has kept getting better and better with Hyper-V since it was introduced with Windows Server 2008 R2. Improving the performance of live migrating a VM from the source host to the target host has been a constant focus for Windows Server, and in Windows Server 2012 R2 these performance improvements have been taken to the next level: Live migration compression is a new feature that accelerates live migration transfer speed by compressing the VHD/VHDX file, improving performance roughly by 2x for most real-life workloads. 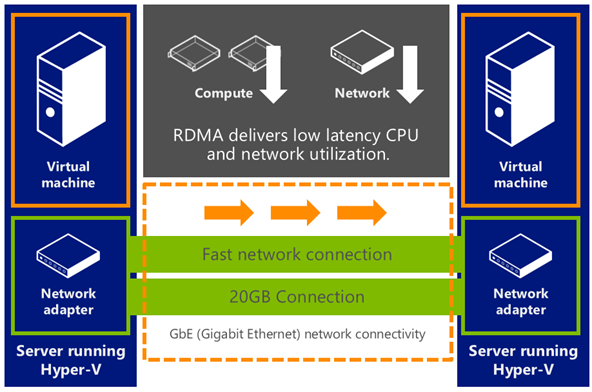 Live migration with RDMA offload is another new R2 feature, which delivers the highest performance for live migrations on> 10GBit network connections, supporting transfer speeds of up to 56 GB/s, by offloading the transfer to hardware and harnessing the power of remote direct memory access (RDMA) technologies. Introduced in Windows Server 2012 R2, Hyper‑V Replica provides a storage-agnostic and workload-agnostic solution that replicates efficiently, periodically, and asynchronouslyover IP-based networks, typically to a remote site. It also allows an administrator to easily test the replica virtual machine without disrupting the ongoing replication. If a disaster occurs at the primary site, administrators can quickly restore their business operations by bringing up the replicated virtual machine at the Replica site. New in Windows Server 2012 R2, Hyper-V Replica now allows for variable (configurable) replication frequencies (30 sec., 5 min., 15 min.) and also supports multiple nodes; this means that tertiary replica sites are supported, for example in the case of a service provider who wants to replicate a customer’s workload to another (tertiary) data center. 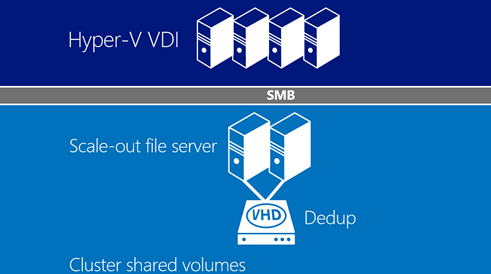 Among other guest clustering options, Windows Server 2012 R2 now also offers shared VHDX files. Shared VHDX files can be stored on a scale-out file server cluster or on Cluster-shared Volumes (CSV) on block storage. Shared VHDX clustering preserves dynamic memory, live migration and storage live migration for a VM that is part of the guest cluster. Enhancements to Linux Integration Services in Windows Server 2012 R2 provide a set of drivers that improve performance and functionality of virtualized Linux instances running on Hyper-V. Very importantly, Linux Integration Services now allows Linux guests on Hyper-V to take advantage of Dynamic Memory. Isolating virtual machines of different departments or customers can be a challenge on a shared network. When these departments or customers need to isolate entire networks of virtual machines, the challenge becomes even greater. Traditionally, VLANs are used to isolate networks, but VLANs become very complex to manage on a large scale. Hyper‑V Network Virtualization solves this problem. With this feature, you can isolate network traffic from different business units or customers on a shared infrastructure without using VLANs. Hyper‑V Network Virtualization also lets you move virtual machines as needed within your virtual infrastructure while preserving their virtual network assignments. Finally, you can even use Hyper‑V Network Virtualization to transparently integrate these private networks into a preexisting infrastructure on another site. 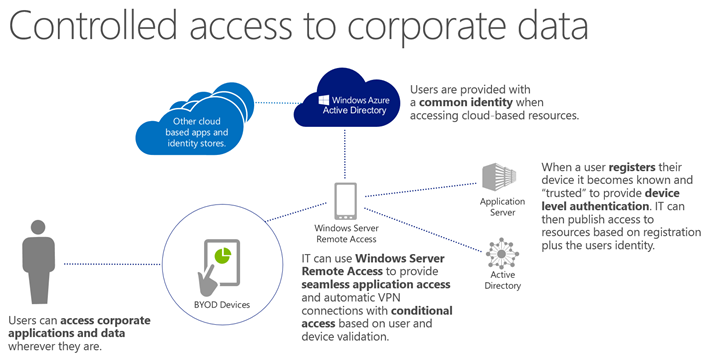 The multi-tenant VPN gateway in Windows Server 2012 R2 allows Hyper-V Network Virtualization, which was introduced in Windows Server 2012, to span physical and virtual networks, as well as across premises, enabling site-to-site connectivity for multiple tenants to be deployed in a single virtual machine and in a highly available environment. This feature is managed through System Center Virtual Machine Manager. Windows Server 2012 introduces new File Services features that let you store server application data on file shares, leveraging the new Server Message Block 3 (SMB3) protocol and taking advantage of low-cost, ‘commodity’ hardware. 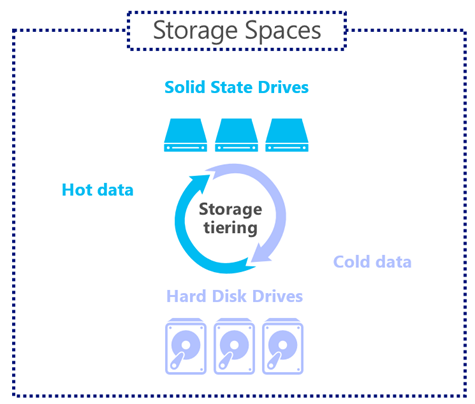 A variety of performance enhancements and availability improvements come together to make file share storage a great low-cost choice for critical workloads such as Hyper-V and SQL Server. File services can now endure a variety of failures transparently – resulting in no interruption in service to the users – or servers – which depend on them for storage. These new File Server features allow you to easily create and manage an optimally available data storage foundation for critical application services such as Microsoft SQL Server and Hyper-V. An array of new SMB protocol enhancements and capabilities such as transparent failover, SMB Direct, and SMB Multichannel give you benefits and performance that are similar to much more expensive storage area networks (SAN). 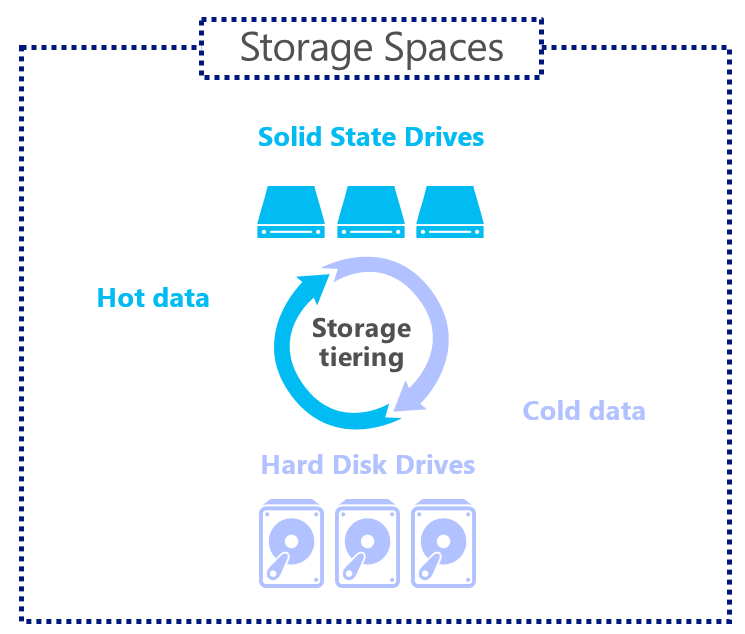 Introduced in Windows Server 2012, Storage Spaces enables cost-effective, optimally used, highly available, scalable, and flexible storage solutions for business-critical (virtualized OR physical) deployments. Storage Spaces offers sophisticated storage virtualization capabilities in-the-box, empowering customers to use industry-standard storage, for both single-node and scalable multi-node deployments. New in R2, automatic tiering allows files to move between HDD and SSD tiers within the same volume, and while keeping the file running. Plus, you can ‘pin” high priority files to the SSD tier. New in Windows Server 2012 R2, data deduplication now supports live VHDs for VDI, which means that data deduplication can now be performed on open VHD/VHDX files on remote VDI storage with CSV volume support. Remote VHD/VHDX storage de-duplication allows for increased VDI storage density significantly reducing VDI storage costs, and enabling faster read/write of optimized files and advanced caching of duplicated data. Work Folders allows users to synchronize files, originating from corporate file servers to their devices anywhere through a sync service. IT can configure a file server to provide Work Folder sync shares for each user to store data that syncs to their devices, including integration with Rights Management. Windows Server 1012 was the first to bring the concept of “Shared Nothing Live Migration” (no shared storage required) to life. Now in R2 it is even better. 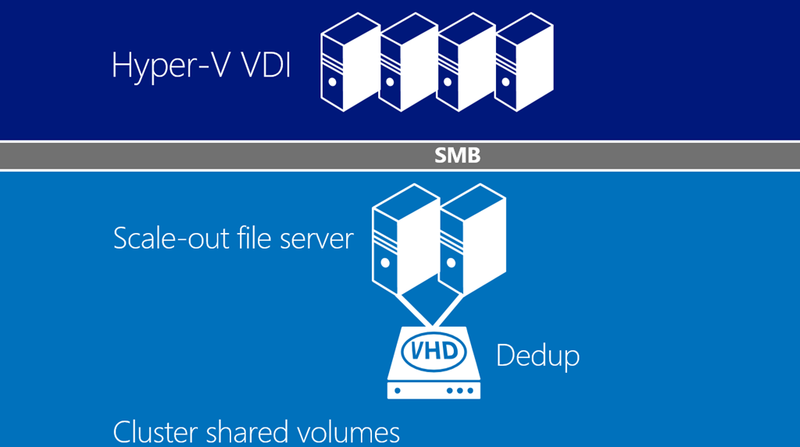 With Windows Server 2012 Hyper-V, you can perform a “Shared Nothing” Live Migration where you can move a virtual machine, live, from one physical system to another even if they don’t have connectivity to the same shared storage. This is useful, for example, in a branch office where you may be storing the virtual machines on local disk, and you want to move a VM from one node to another. This is also especially useful when you have two independent clusters and you want to move a virtual machine, live, between them, without having to expose their shared storage to one another. You can also use “Shared Nothing” Live Migration to migrate a virtual machine from one datacenter to another provided your bandwidth is large enough to transfer all of the data between the datacenters. 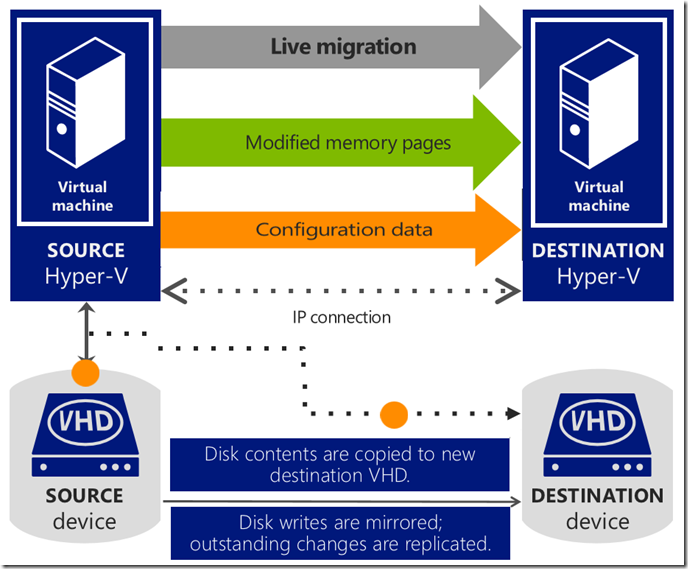 When you perform a live migration of a virtual machine between two computers that do not share an infrastructure, Hyper-V first performs a partial migration of the virtual machine’s storage by creating a virtual machine on the remote system and creating the virtual hard disk on the target storage device. This copy is performed by transferring the contents of the VHD between the two servers over the IP connection between the Hyper-V hosts. After the source and destination virtual hard disks are synchronized, the virtual machine live migration process is initiated, following the same process that was used for live migration with shared storage. After the virtual machine’s storage is migrated, the virtual machine migrates while it continues to run and provide network services. After the live migration is complete and the virtual machine is successfully running on the destination server, the files on the source server are deleted.